Hydrology is the study of distribution and movement of water on and below the surface of the earth. When studying the hydrology of a landscape, it is critical to consider the role of environmental changes such as land-use and climate. The implications of land use changes on hydrology have been an area of intense interest to research hydrologists over the last fifty or more years. Issues of land use change affecting hydrology include increasing urbanization, changing vegetative cover, land drainage, and changing agricultural practices. UHPSI is interested in representing and quantifying the existing landscape at Ucross ranch in a hydrological model using the Soil and Water Assessment tool (SWAT) to both understand the current condition hydrology of the ranch and to predict hydrologic response to changes in vegetative cover, grazing regimes, and riparian area management. Hydrological modeling and prediction consists of: (1) Getting to know the landscape through field visits and expert observation; (2) Collection of field information to feed into the model, including spatial (e.g. topography, land-use/land-cover, soil ), and tabular (e.g. weather and climate) data; (3) Delineation of the watershed – i.e. mapping drainage areas based on topography; (4) Simulation of the model to represent and quantify water movement and distribution across the landscape using multiple parameters; and (5) Parameterization – the process of comparing model generated output with field measured information. The final model helps to quantify the amount of surface runoff, infiltration, evaporation, groundwater recharge, snow melting, evapotranspiration based on a water balance equation. Predictive hydrological modeling is important for water resource managers, as they require information on the amount of flow required to sustain river ecological processes, and to ascertain how much water is available for out of stream use (e.g. irrigation, municipal water use). The predictive capability of a hydrologic model is also important for “what-if” scenario analysis. Scenario analysis allows the modeler to play around with different land-use and management scenarios to come up with the optimal scenario for water conservation and utilization. 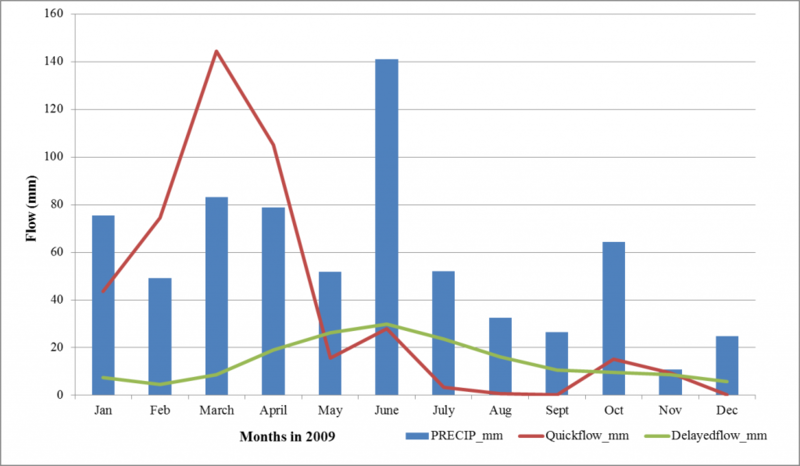 UHPSI, led by hydrologist Ambika Khadka, designed and tested a SWAT-based hydrologic model during the Summer and Fall of 2013. 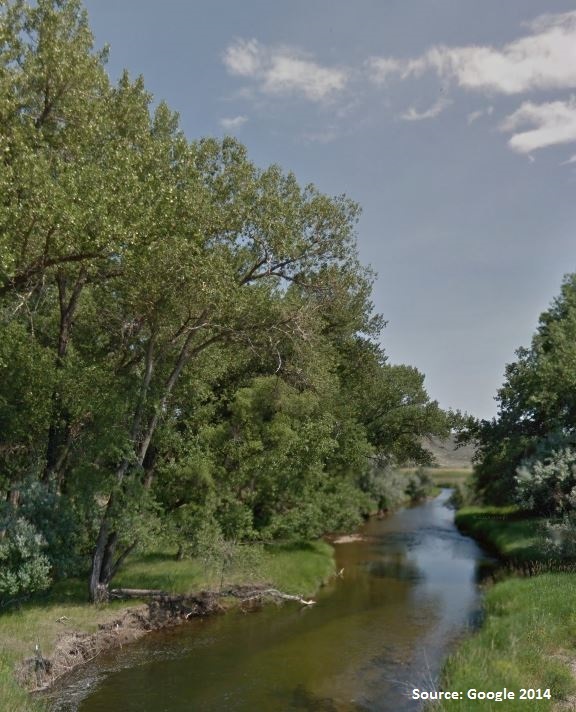 Using existing stream gauges for calibration and parameterization, the model encompasses a 1,110 square mile catchment area, extending from the Bighorns to Clear Creek at Arvada, Wyoming. Among the 28.7 in of annual precipitation (both rain and snow) in the catchment area, 47% is lost as evaporation, and 42% makes it to the stream. Of the water that makes it to the stream, 44% is contributed by surface flow, 41% by lateral flow and the remaining 15% by groundwater. Around 18% of the precipitation infiltrates the soil, of which 35% is returned to streams as return flow, 45% is lost as evaporation from the shallow aquifer with only 10% actually recharging the groundwater in deep aquifers. The total loss of water from the surface and subsurface layer due to evaporation is very high with more than 50% of the total precipitation the area receives. We hope to make management recommendations based on model outputs and scenario analysis that will help Ucross Ranch maximize water storage. For example, one method for conserving water in the area would be to reduce the surface runoff and lateral flow and increase water retention in the soil and groundwater for usage during dry season. 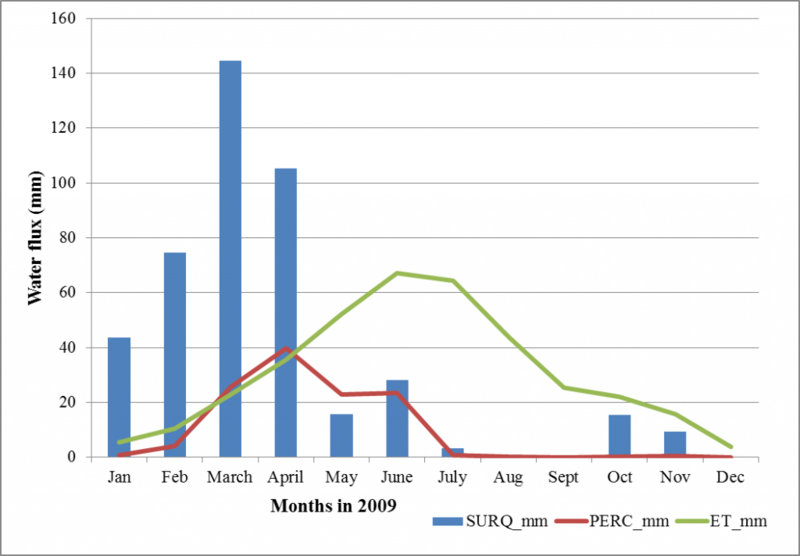 The monthly average prediction of hydrological components such as streamflow, quickflow, delayed flow, surface runoff, infiltration and evapotranspiration for the 1,110 square mile catchment area are presented in the following hydrographs. 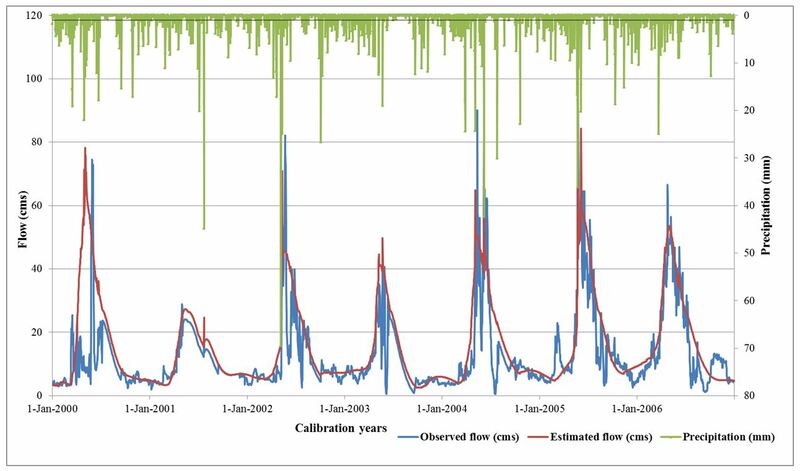 This figure presents observed flow from stream gauges (blue line) with estimated flow from the SWAT hydrologic model (red line). Note the tight fit between observed and modeled stream flow! Precipitation is included for context in green.